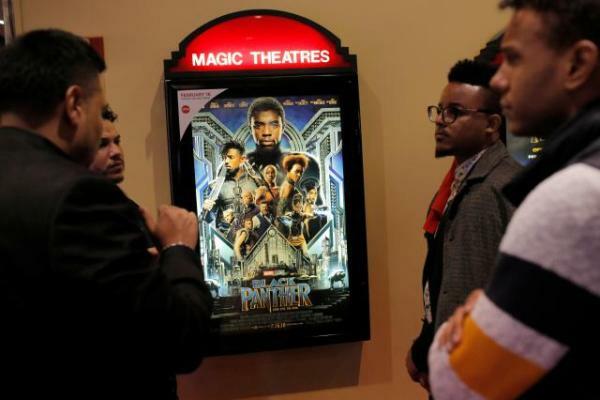 Disney-Marvel’s “Black Panther” is heading for a super-heroic $218 million debut over the four-day President’s Day weekend at 4,020 North American locations, estimates showed Sunday. That number means that “Black Panther,” starring Chadwick Boseman and directed by Ryan Coogler, has doubled its original tracking in less than a month. The film, which carries an estimated $200 million production cost, had been tracking to bring in between an impressive $100 and $120 million when first estimates emerged on Jan. 25. Since then, “Black Panther” has become a must-see movie for many moviegoers, underlined when Thursday previews brought in $25.2 million, the largest Thursday night preview gross for a February opener and the second-largest preview gross for a Marvel film. The film’s estimated three-day gross of $192 million is the highest debut ever for a February film and the fifth highest of all time. Combined with an estimated international debut of $169 million from 69 percent of the international market, the estimated global debut stands at $361 million through Sunday. “Black Panther” has demolished the record for the largest Presidents Day weekend, blowing past “Deadpool‘s” 2016 mark of $152 million. Overall North American movie going for the four-day period should hit $300 million — far above the $278 million mark in 2016, according to comScore. ”This is proof that the big screen experience may arguably be the most powerful platform of change in our society,“ said Paul Dergarabedian,”senior media analyst with comScore. Boseman portrays King T‘Challa, ruler of Wakanda, a technologically advanced society, who conflicts with Michael B. Jordan’s Eric Killmonger, who intends to take over the throne.